23 Seagate is situated in the heart of the town in one of the most sought after areas of Irvine. The property has maintained many of its original features dating back to circa 1888. The property comprises two receptions rooms, two bedrooms, and a box room. Externally there are generous garden grounds to the rear and on street parking to the front. In summary the property layout extends to an entrance hallway with stairs to the upper level. 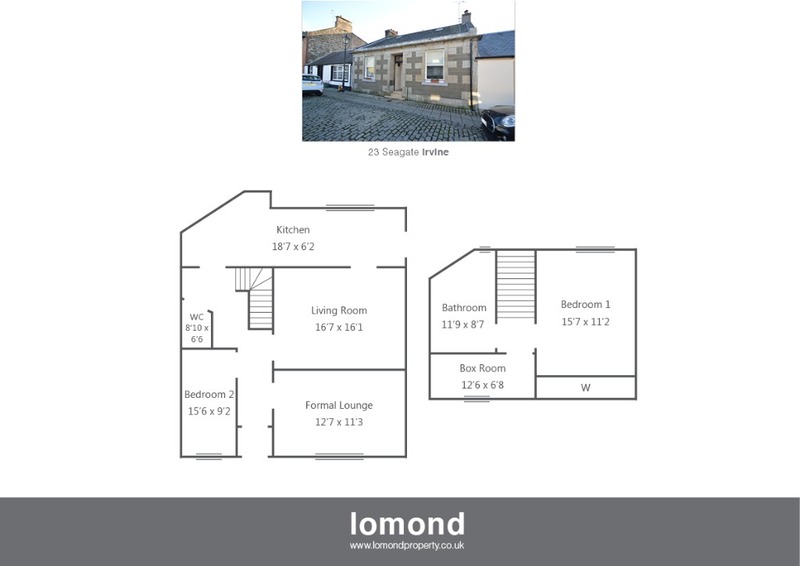 The ground floor living space is flexible, with two receptions rooms, bedroom, WC and kitchen. The current owners layout, has the front facing lounge as a formal area, and to the rear, a more relaxed sitting room with dining area. To the very rear of the property the kitchen stretches the entire width of the property, and comes with floor mounted units, gas hob, oven and a wall mounted Worcester boiler. The first of the bedrooms is on the ground floor and is double in size. The current owner has added an internal shower to the room. A WC completes the ground floor. The upper level houses a double bedroom, box room and family bathroom. The bathroom is generous in size and comes with bath, separate walk in shower, WC and WHB. Externally the property has grounds to the rear, laid to a combination of patio slabbing and mature shrubs. Seagate is a historic area of Irvine, situated in the heart of the town centre. Irvine town provides access to a range of amenities including supermarkets, bars, restaurants and town centre shopping. There are a number of local primary and secondary schools within the greater Irvine area.